STUNNING CONDITION! HOME ESTATE AGENTS are delighted to bring to the market this executive style five bedroom property located on the exclusive Minster Drive in Davyhulme. 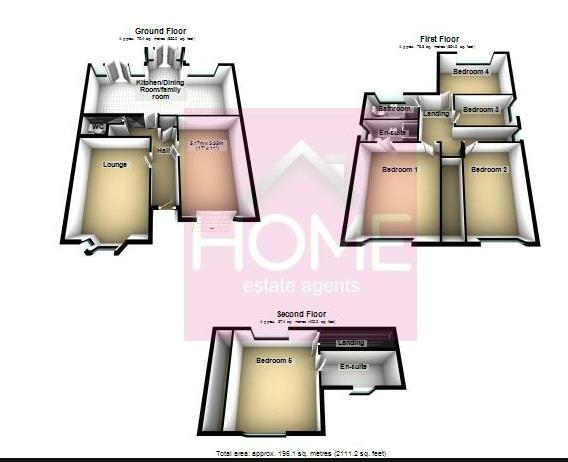 The well presented property boasts spacious living accommodation to all floors with en-suite facilities to several bedrooms and a jewel in the crown modern fitted kitchen. The location is ideal to access all local amenities and is within the catchment area for several popular schools. The accommodation comprises of entrance hallway, lounge, kitchen, diner family room, downstairs WC and integral garage. To the first floor are four good sized bedrooms and family bathroom. Bedroom one has en-suite facilities. To the second floor is the master bedroom with en-suite facilities. The property is warmed by gas central heating and double glazed throughout. To the outside front is a lawned garden and block paved driveway offering off road parking for several vehicles. To the rear is a South facing lawned garden with raised decked patio area. To book your viewing call HOME on 01617471177. UPVC double glazed bay window to front. Solid wood flooring. Television point. Double panel radiator. UPVC double glazed opaque window to rear. WC. Wash hand basin. UPVC double glazed windows to side and rear. UPVC double glazed French doors to rear. A range of fitted modern wall and base units. Quartz work tops. Induction hob. Built in microwave. Two built in electric ovens. Coffee maker. Instant hot water tap. Integrated fridge. Integrated freezer. Tiled floor. Contemporary style radiator. UPVC double glazed French doors to rear. Television point. Tiled floor. Contemporary style radiator. UPVC double glazed window. Built in wardrobe. Double panel radiator. UPVC double glazed opaque window. WC. Wash hand basin. Shower cubicle. UPVC double glazed window. Built in wardrobes. Double panel radiator. UPVC double glazed window. Bath. wash hand basin. WC. Shower cubicle. Ladder style radiator. Two uPVC double glazed windows. Built in wardrobes. Double panel radiators. Velux roof window. WC. Wash hand basin. Shower cubicle. Additional eaves storage. To the outside front is a lawned garden and block paved driveway offering off road parking for several vehicles. To the rear is a South facing lawned garden with raised decked patio area. To book your viewing call HOME on 01617471177.